For this months session I decided that I wanted to do something out of character for many beer blogs on the internet. I wanted to say thank you to the large multinational brewers and show that we are not all against them. It's not us versus them or craft beer versus mass produced beer. At the end of the day, we are all united in the cause of promoting beer as the alcoholic beverage of choice in a world where beer sales appear to be dropping to be replaced by wine, alcopops and harder liquor. What we do is give voice to the little guy. Large breweries have little need of us promoting their product as they have millions to spend on advertising. We beer writers don't get paid but we give the little guy a voice because how else can they promote their products? I may spend most of my time writing about small breweries and their beer and try to promote drinking local beer from the locality or country you are in but that does not mean I do not respect the big boys. There are many things I can be thankful of the big breweries for. Sponsoring sporting events and giving us the Heineken cup, Guinness summer series and until recently, the Magners league. OK they are all Rugby tournaments but for me, these are the only sporting events worth watching. I am thankful to a few specific breweries though. I am thankful to Diageo and specifically the Guinness brand for producing a stout that is perhaps not very interesting, but it is a solid unchanging product that is always a joy to drink when I can't get something a little more exciting. I just wish they would make better use of their small pilot brewery and produce more exciting products. I know it's there and I know they employ brewers to brew special beers but almost none of them ever see the light of day. Like this for instance (see date :p). Of course they do produce some great bottled stouts which would do well to be bottle conditioned again. Next I would like to thank Pilsner Urquell for two reasons. Firstly they produce a wonderful product which is often overlooked by beer writers. Certainly their unpasteurised and unfiltered Pilsner served from wooden casks is worth killing for. I can also thank them for the time they flew me to London for the British open Golf championship and to cover their sponsorship as the official beer of the tournament. We now however come to the main brewery I want to thank. This brewery produces what, in my opinion is one of the worst beers on the planet (though there are far worse). It is an absolutely massive company, owning many different breweries and brands. 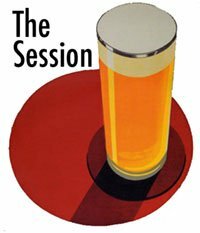 I got the idea for this session while I was at the beer bloggers conference earlier this year. Both Scott and Kristy represented their company brilliantly and Scott said "we are not the anti-craft". They were also the primary sponsors of the conference, a brave move considering that most of the writers who attended would rarely have anything good to say about their primary brand. I am of course referring to Molson Coors, a mega brewery that a long time ago saw the need to diversify and embrace small scale brands such as their Blue Moon brand which is marketed as a craft beer. It was launched in 1995 so it has been around for quite some time and was my wife's, grandmother's favourite beer while she was alive. While not all that great in the bottle, it comes alive on tap and is a good beer. Certainly it is a gateway beer to something more interesting. Molson Coors is not content with that though, what is the point of having a gateway to craft beer if it sends people away from them? Well to address that issue, they have a number of other small breweries under their belt and instead of doing what large breweries did in the past and close down their acquisitions, they embrace them and even invest in them. The Worthington's White Shield brewery is a perfect example. Rather than close it down, they spent over a million pounds on new equipment and produce some fantastic beer from this 1500 barrel (1760hl?) plant. Sharp's is another example of how they have embraced a smaller regional brewery and are using their considerable influence to increase sales. Now some traditionalists might still argue that they are destroying the identity of the breweries they buy but I certainly don't think that is their intention and I question if it is even true. At the end of the day, breweries brew beer to make money. If they don't make money then they might as well brew beer as a hobby at home if that's all it is. So thank you to Molson Coors, the most benevolent large mega brewery that I know of. I may not think much of Coors light but I applaud them on having such a massively popular brand and I thank them for their contribution to beer. As time goes on, I suspect that more and more people will want more flavour from their beer. Products such as Coors light will fade away and more flavoursome beers will start making a comeback and Molson Coors are in a very good position to fulfil that change with brands like Sharp's and even Blue Moon. The biggest problem with beer is the image that beer is the drink of lager louts where as wine is a drink of sophistication, even though beer can be more diverse in flavour and pair with food better than wine. It also has far less alcohol usually. If someone from Molson Coors marketing is reading this, can I suggest you do something to address the image of beer? Show beer as a sophisticated drink to share as a couple in a restaurant. A 750ml bottle to share, like DW for instance. I may be losing the run of my train of thought here, sorry. Anyway, a big thanks to the large brewers I mentioned and some of those I did not. And in the interests of satire (something I said would be acceptable as a topic), I would like to thank Diageo again, this time for the Smithwick's brand. Smithwick's has released a new beer and I have yet to try it. I might get a chance this weekend. Smithwick's Pale Ale is pulling all out all the stops. Ads on bus stops say "Craft brewed for fuller flavour" or something like that. Essentially claiming this is a craft beer and because no legal definition of craft beer exists, they are perfectly entitled to do so. so a big thanks to the marketing people at Diageo for trying to blur the whole craft beer thing. Maybe we should go back to micro brewed beer and forget this term craft beer. Let's try and seem them claim they are a micro brewery as that does have a legal definition for excise duty reasons I believe. In fairness, I am quite impressed by their website. They actually have tasting notes. The beer is finished with Amarillo so I am curious to see what it's like. By all accounts it's not a bad beer, though certainly no American pale ale, Amarillo aside. The term I use for Irish microbrewed beer when "craft" isn't up to the job is "independent". We're kinda lucky in Ireland in having an almost clean split between foreign-owned macros and local, independent, micros. Just noticed I labelled it wrong, will fix when I get to a pc! Here's mine! Nice topic by the way. Reuben - Hope I didn't wander too far from what you expected, but here's a post about institutional memory. Looks good Stan, I think it still comes under the spirit of the theme. Thanks for playing host! Here is my contribution. In the wine industry happened the same and experts were clapping hands to big firms. At the end the advertisement they made is making people known the product better and all the industry benefits for that!